How high are realtors´ and lawyers´ fees in Cambodia? What about other property purchase costs? How difficult is the property purchase process in Cambodia? Foreigners cannot own land in Cambodia, under Article 44 of the Constitution. Land can be bought through a local company. Acquiring Cambodian citizenship brings the right to buy land, a route actively encouraged by the government. Land is sometimes bought through a Cambodian nominee, but this has been ruled to be against Constitution, and is unsafe. Foreigners often hold land in Cambodia through a company. This structure offers the least risk for the foreign investor, who can be an individual, or a legal person. More than one piece of land can be held. But setting up a landholding company is expensive, and there is a high maintenance cost, and taxes on rental income are quite high (see above). The applicable legislation is the Law on the Investment of the Kingdom of Cambodia (Chapter VI, Article 16), which states that ownership of land can be vested in "legal entities in which more than 51% of the equity capital are directly owned by natural persons or legal entities holding Cambodian citizenship". Moreover, "use of land shall be permitted to investors, including long-term leases of up to a period of 70 years, renewable upon request". Different classes of shares. The land holding company must be 51% Cambodian owned, but is usually structured with 2 classes of shares having different rights, one class held by foreign investor, one by local investors. For example the Cambodian entities or persons might have lesser rights to transfer shares and to nominate directors, and company decisions might require a 2/3rds majority. Minority control document. A series of private agreements are usually drawn up by which the Cambodian shareholders grant the foreigner special rights - e.g. a permanent majority on the board, or different powers of attorney, or blank shareholder transfer forms. Land Security. The landholding company often registers a mortgage on the land, which means that the land cannot be transferred without the consent of the foreigner. The result is not 100% bullet proof - the main risk is always the Cambodian partner. Because the Cambodian courts are corrupt and decisions are normally bought, the buyer should also methodically undertake due diligence on the local partner to reduce the likelihood of an issue arising in future which will reach the courts. "In 10 years, we have only had 2 problems," says Martin DeSautels, managing director of DFDL Mekong Phnom Penh. "But if you have a problem and you have to go to court, sorting things out can cost a lot." Deposit the required initial capital (minimum of KHR2 million or US$494) in any authorized bank. The bank will then issue a certificate of the deposit. Check the uniqueness of the company name at the Ministry of Commerce. This process costs about US$10 and takes five days to complete. Obtain a company registration form (CIB 01R) from the Cambodian Investment Board. This may also be downloaded from the CIB website - http://www.cambodiainvestment.gov.kh, and costs US$5 to US$10. Companies are required to have company seals. These are usually made by the Ministry of Commerce but the company may choose to have it done elsewhere. The seal costs about US$15. Publication will cost around US$42 and will take seven days to be released. At least two copies of the approval of the newspaper and application documents must be secured for applying for registration. 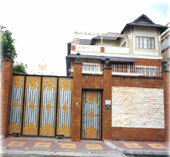 The registration documents must then be stamped and approved by the Phnom Penh Tax Department. This can be accomplished in one day. The fee is US$26. Tax registration is required at the Real Regime Tax Office. The Ministry of Labor must be notified when starting operation and hiring or dismissing employees. 2. Taking control of land through a lease. Long-term leases are another common way for foreigners to control land in Cambodia. For instance, the super-luxurious Phnom Penh Raffles Le Royal Hotel is held on a long-term lease. A long term lease gives the lessor all necessary rights to develop the land - e.g., he can get construction permission in his own name. This is a very simple structure, but is less secure than the company structure. There is no maximum term for which land can be leased from a private owner - the period is indefinite in the Land Law. Leases commonly last 50 years, 70 years, or 99 years. Leases longer than 15 years must be registered at the Land Office. On state land, there is a 40 years maximum, with the possibility of extension. A background check on the owner is essential, as in the case of the landholding company structure. Leasing from a greedy, politically well-connected owner can be disastrous. Dispute resolution is often placed by contract outside Cambodia, e.g. in Singapore. This is less effective than widely believed, as many land disputes do not involve disputes over the contract itself, but over other matters. In addition, Cambodian courts often refuse to recognize foreign arbitration, or revisit issues already decided in the Court of Arbitration. A clause is often inserted requiring the owner to get the lessee´s permission to sell. Or preventing the owner from selling, unless the new owner recognizes the lease. In addition, a ´block sale notice´ can be registered with the Land Office, instructing the office not to sell the land without the lease owners´ permission. There are currently two problems with the lease structure. It is not settled who owns the buildings after the lease has finished. The 2nd and 3rd floors of buildings clearly belong to the lessee, who can register title. Because the owner of the 1st floor also owns the land, according to the Land Law, once the lease is finished the owner of the building is the landowner. But according to the Law on Investment (covering companies registering for tax incentives) the buildings are owned by the lessor. The issue could be settled by changes in the revised Land Law and elsewhere: "The Cambodian authorities are reportedly thinking of setting up a separate registry to registed the ownership of buildings. This would be a massive step forward," says Matthew Rendall of Sciaroni & Associates. Such a register would give effect to the Law on Investment provisions. Hitherto leases been recordable on title deeds at the Land Registry. "I have heard that now that they are registering," says Rendall. "If this is true, it is another significant development, which would greatly improve the leaseholder´s security." 3. Buying land by acquiring Cambodian citizenship. Taking out Cambodian citizenship is one way of getting the right to buy land, which the government is encouraging. Citizenship applications will be considered if a significant investment is being make in Cambodia. It is important to ensure that the Ministry of the Interior, the Council of Ministers, and the President, all agree to the grant of Citizenship. Often used by investors because it is simple and cheap, the nominee structure ignore the Constitutional prohibition on direct ownership of property by foreigners, and is illegal and strongly discouraged by all land lawyers. The following is how the structure works. The investor signs a trust agreement with the holder of the land: "I hold this land for you." The land is then mortgaged, and leased to the foreigner. The consequence of adopting this structure could be expropriation by the state, or forced sale of the land. Between 1975 and 1979, there was no private land ownership in Cambodia. Almost all judges were killed during this period, and all records destroyed. In 1989 a Land Law was issued. In 2001 a new Land Law was issued. A further revision is in preparation. ´Soft title´(possessory right), which is based on the right of possession and is issued by the local village chief officials. ´Hard title´, which is registered with the Land Office, and trumps claims of ownership based on possessory right. Although ´soft title´ is somewhat weaker, it applies to almost all land in Cambodia. "My experience is that the local level registration is just as secure as the national level registration," says Sciaroni´s Matthew Rendall. "There is not that much risk, and you do avoid the registration cost." However, leases and mortgages cannot be registered on a possessory right title. Possessory rights over private land can be converted into hard title, but this involves paying a 4% transfer fee and is time-consuming. Most landlords prefer to wait for the conversion to be done by World Bank titling scheme, which will not involve the 4% transfer fee. One of the most common land ownership problems is boundary disputes. It is important to register boundaries, otherwise the foreign owner is likely to become involved in un-winnable legal disputes. Similarly, the foreign owner should guard against squatters, for instance by erecting a fence and employing guards. It is important to conduct a title search. It is important to know who it is, so that the buyer does not pay the wrong person. The title search will also reveal registered mortgages and other encumbrances. Bear in mind that there can be other impediments to transfer which are not visible in the title search, e.g., a claim by a senior politician. Often the buyer will not be given the actual title for the search, because this is the sellers´ only evidence of ownership. So the buyer will get a copy of the title. It is important to make sure it is a recent copy. The Land Office will not complete the transfer till they see the receipt certifying payment of the transfer tax and land office fees. Though the registration fee is officially 4%, this amount is in practice never levied. Each cadastral office calculates a certain amount in obscure ways, usually amounting to around 1.5% to 2%. Normally, the cadastral officers will write a transaction price on the contract which is different to the real price. "In only two case have I ever seen the 4% paid," says a local realtor. "One was a World Bank transaction; the other was a German who wanted to report the real price to his company." There is US$800 to US$1000 ´service fee´, paid to the cadastral office, which covers all other ´service fees´. A tax is payable according to the absolute size of the land and building, according to type - commercial, residential, or rural. On sale, there is an unused land tax, calculated by the cadastral officer. Balance - 80%. Typically the balance is not paid until the title is converted into ´hard title´. The whole process of registering property can take around 56 days to complete. Few Cambodians would use a notary or lawyer. "You pay double," says the local real estate agent. "If you go through a lawyer, he just does that the cadastral officer does. So choose a good cadastral officer, and use a lawyer to do due diligence, but pay him for just that job." However the foreigner will need to set up a landholding company or create a watertight lease structure, and the complexities of this process make it more or less essential to employ a lawyer. Transfer tax of 4% is levied on the assessed value of the property. The assessed value of the property is usually based on total number of square meters, the land´s location, use, and other factors. How landlord-friendly is the law in Cambodia?